Bucharest is the capital of Romania, known for its history, architecture and incredible nightlife. 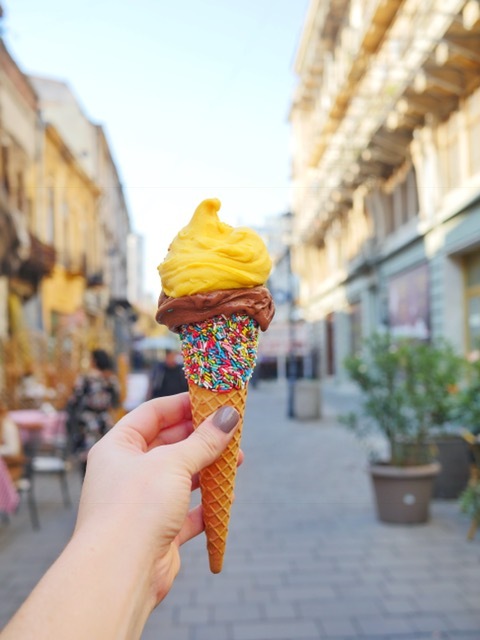 Although I was only in the city for four short days, I made the most of my time, quizzing locals on where to find the best dessert in Bucharest. Some say falling in love happens slowly, and others say it happens all at once. I can tell you the precise moment I fell in love with Bucharest. While having breakfast at Caru’ ce Bere my first morning in Bucharest, a friend ordered apple cake. I asked to take a bite and he warned me that all desserts are sweeter in Romania because the people here like their sugar. And that was that. Love at first bite. There was no shortage of stewed apples on top and the cake absorbed the sweet apple syrup, infusing the entire cake with flavor. The ambience of Caru’ ce Bere was the perfect setting for my first meal in Bucharest. The German beer hall-themed restaurant is one of the city’s most popular places to eat. 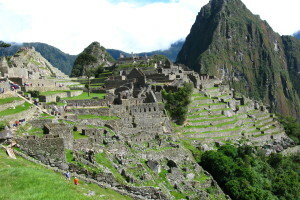 People wait up to two hours at night to join the festive atmosphere and traditional dancing in the evenings. The stained glass windows, carved wood and murals fooled me into thinking the venue was a former cathedral. Upon closer inspection, though, I noticed that the murals depict people drinking beer. Wholly different from a holy mural! Papanași is one of Romania’s most popular desserts, and for good reason! Papanași is a boiled or fried dumpling shaped a bit like a mini bundt cake with a hole similar to a donut. The hole is filled with sour cream and jam, and the hole of the donut is put back on top like a delicious little hat. The secret to finding a really good papanași? There should be cheese in the dough which adds flavor and depth to the dessert. You can find versions of this dessert all around Romania, but I tried La Mama’s version while on tour with Delish Experiences Time Traveling Tastings tour. 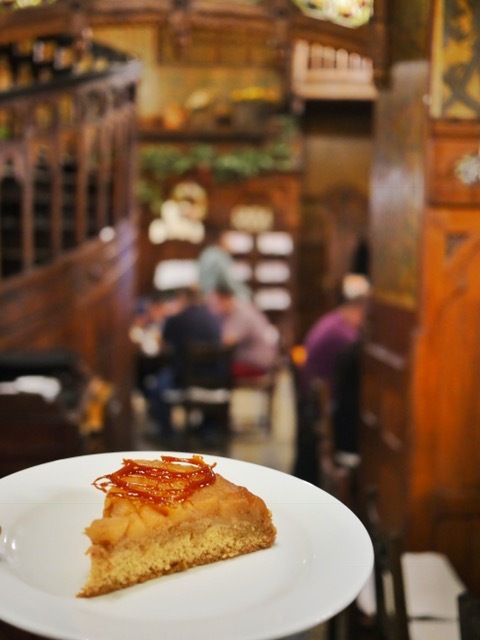 We started the day with coffee in a modern coffee shop on the outskirts of the old city, made our way to a restaurant where we tried dishes found on peasant tables, and ended on a sweet note at La Mama with a Romanian cheese and wine tasting and papanași. I was a little skeptical when I was told there’s sour cream in this dessert… but I was surprised at how well the sourness of the cream and sweetness of the jam go together. This is a dessert I’m hoping to try again soon! 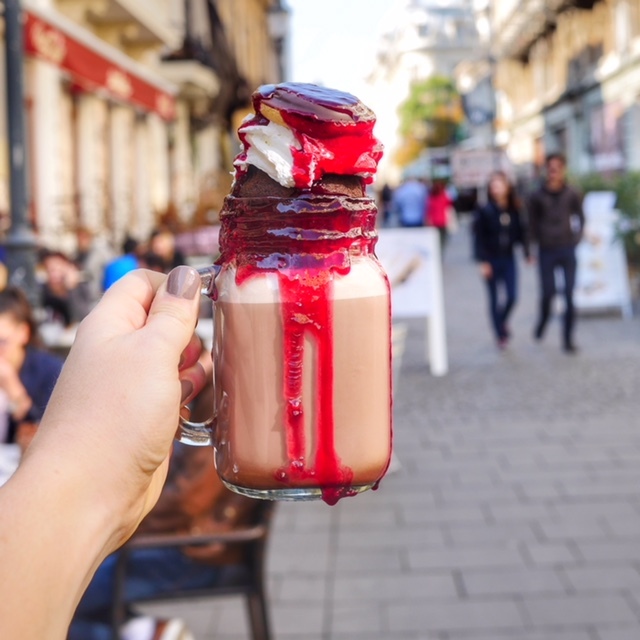 I thought Sydney, Melbourne and Perth had the lockdown on the most creative freakshakes in the world, but Bucharest’s take on the freakshake is the most unique one yet! Instead of the typical ice cream-based milkshake, topped with delicious and over-the-top sweets, Coffeol in the Old City gives the option of a warm base. Will you choose the Black Forest shake with a hot chocolate base, topped with a brownie and chocolate cherry cookie? 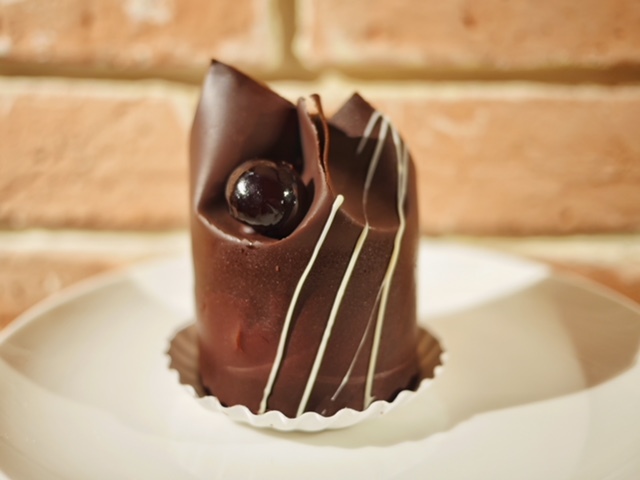 If white chocolate’s more your style, go with the Belgian Choco. 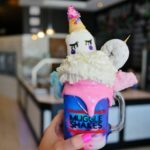 The warm white chocolate pudding base with rainbow sprinkles, a vanilla cupcake and marshmallows on top is unlike anything I’ve ever tried. 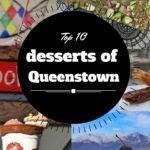 Of course, ice cream-based drinks are also an option, but in a city that dips below freezing during the winter, it’s nice to have a warm option! At 25-28 lei (approximately $6.39-$7.16USD) for a shake, these drinks are $4-$20 cheaper than shakes I’ve tried elsewhere in the world! Don’t fill up on freakshakes though, because Romania’s best ice cream is right next door! 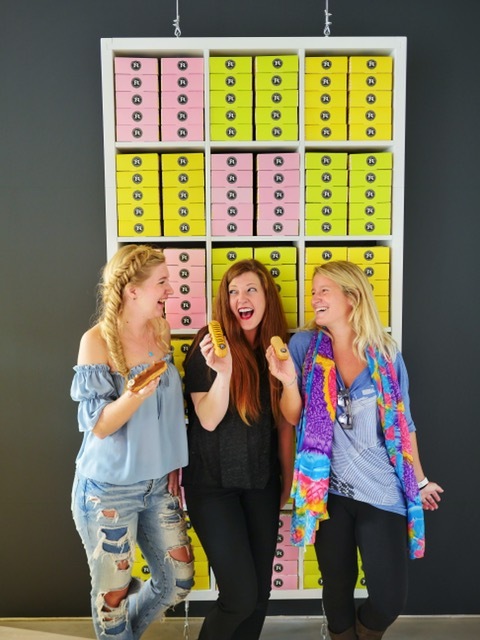 I had a tough time making a decision because their variety of flavors is extensive, but I eventually settled on a Belgian chocolate and peach and mango combination in a sprinkle cone. The ice cream was smooth and creamy and perfect for the unusually warm day at the end of October. 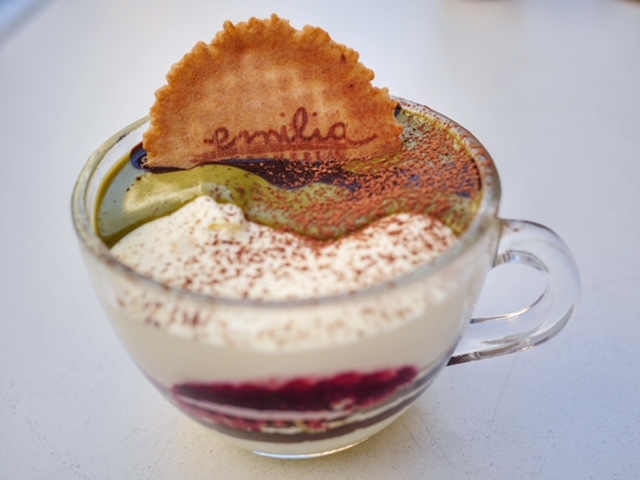 If you’re not in the mood for ice cream, Emilia’s is known for dessert bowls. We tasted the Tazza al Pistacchio layered with biscuits, mascarpone, pistachio cream and berries. 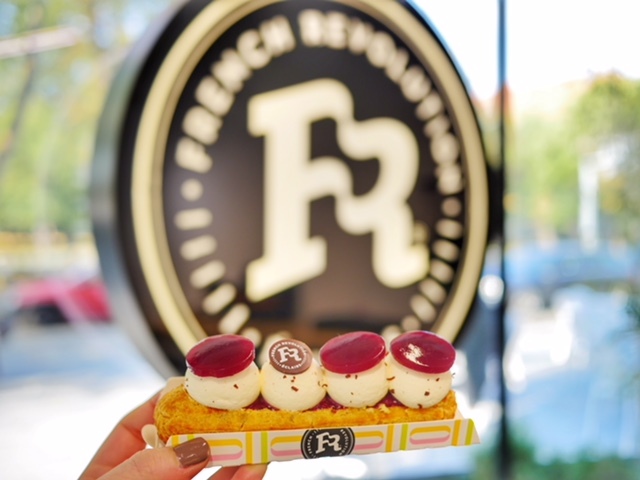 After spending a couple weeks in France, I was skeptical when I heard that the world’s best eclairs are made in Bucharest. 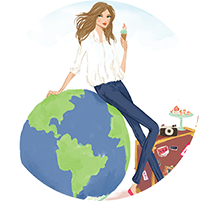 I mean, it’s no surprise that they have the world’s best papanași, but eclairs? Shouldn’t the best be somewhere in Paris? 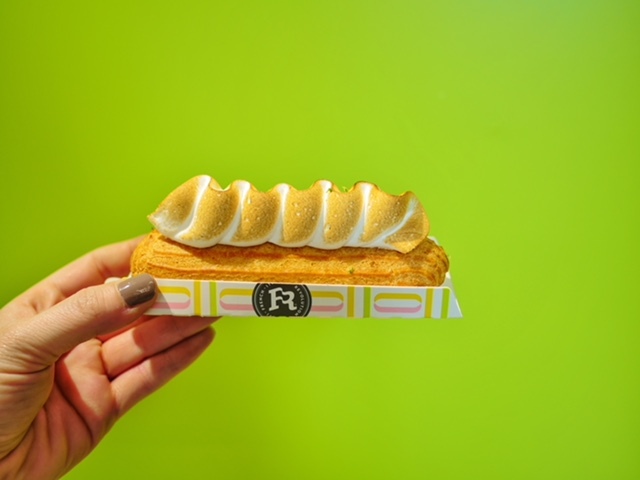 One bite of the Kalamansi eclair topped with Italian meringue and I was sold, though. I tried 4 more eclairs just to make sure it wasn’t a one-hit wonder. 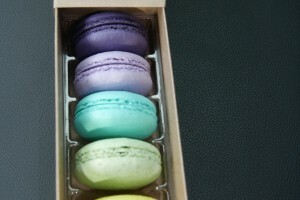 I can vouch for the deliciousness of the caramel, mango, forest fruits, and chocolate hazelnut, too. 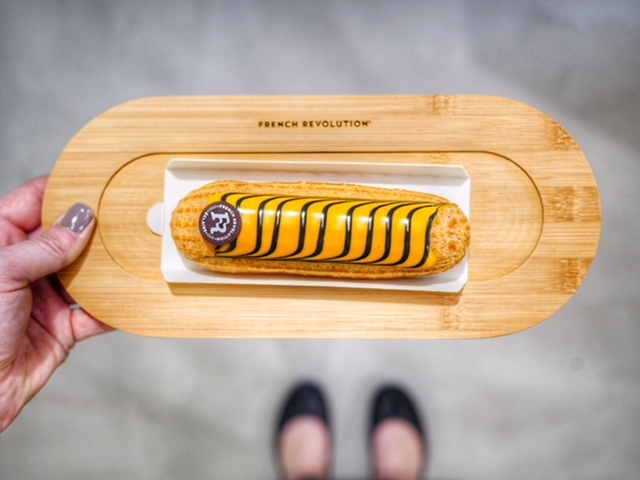 French Revolution, opened in 2013, has two locations in Bucharest and sells 2,000 eclairs every day. 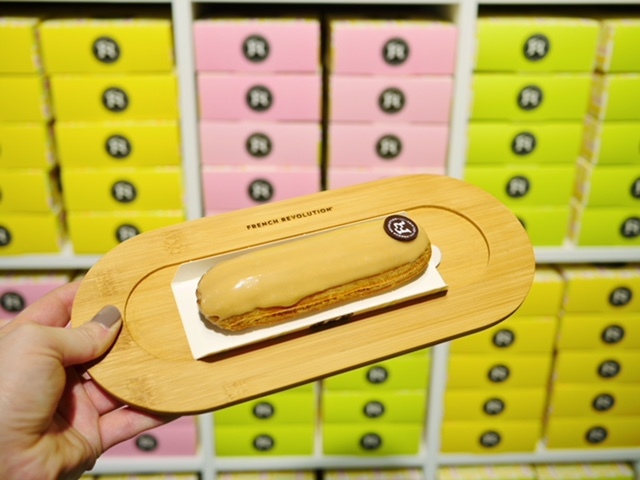 You’re sure to get a fresh eclair because, even though they have a three-day shelf life, French Revolution only sells eclairs on the day they are made to ensure that customers get the best possible experience. 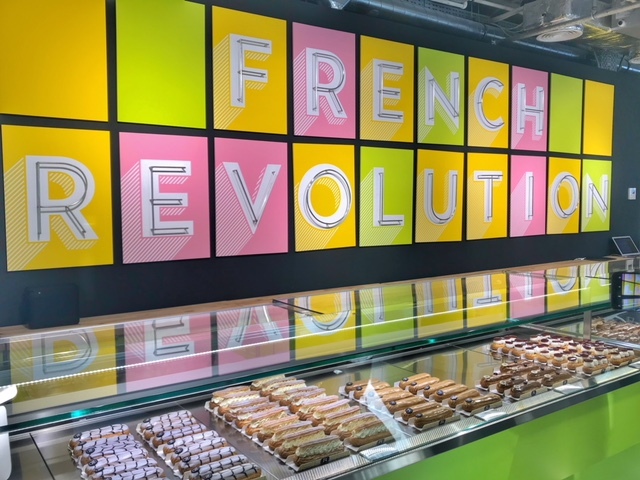 After all, they’re importing special butter from Normandy and making their own salted caramel… it would be a shame to ruin the experience with a stale eclair. 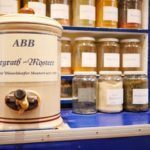 My trip to Bucharest was a whirlwind tour with Experience Bucharest. One hundred bloggers, vloggers, Instagrammers and influencers descended on the city with the aim to increase tourism in this amazing, yet often overlooked destination. 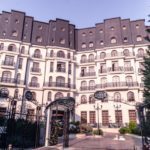 I was over the moon with the exceptionally sweet, creative desserts of Bucharest and found it hard to believe just how affordable it is to eat in the city. 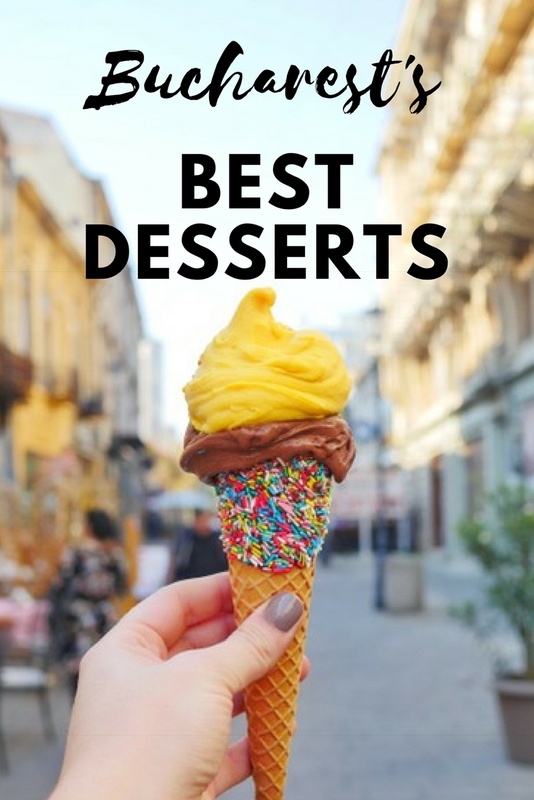 I still have a few spots the locals have recommended left on my list to try… so I think I’m going to need to go back again soon to continue my research on the best dessert in Bucharest! 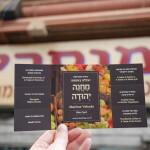 Note: Some of these desserts were provided to me free of charge during excursions with Experience Bucharest. I take dessert seriously though, so all opinions are my own, and I’ll never recommend anything that isn’t awesome! 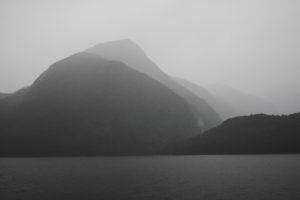 Doubtful Sound or Milford Sound? 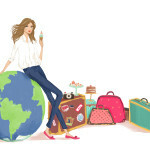 Day trip or overnight? These are the questions you’ll face when deciding to visit the fiordlands, one of New Zealand’s three UNESCO World Heritage sites. Read on for 10 reasons to choose an overnight trip in Doubtful Sound with Real Journeys on The Fiordland Navigator.